Humans have made 8.3 billion metric tons of new plastics since 1950 and approximately half that total was made in just the last decade. It is estimated that that the majority of all plastics ever made – 79% – is still lingering in landfill or in our natural environment. At current rates of production and growth , it was perhaps only a matter of time until the public called time and announced a ‘War on Plastic’, spurred on in recent months by Sky’s Ocean Rescue campaign and of course, David Attenborough’s stark and revealing finale of Blue Planet II. This year the Clean Seas Wales partnership will be launched, made up of a number of stakeholders to deliver on Wales’ Marine Litter Action Plan. This is the year we celebrate the 30th anniversary of the Blue Flag Award in Wales, Cardiff welcomes the Volvo Ocean Race at the end of May, Visit Wales launched their ‘Year of the Sea’ and all around us the clamour to break our relationship with plastics grows. The statistics are crippling and the challenge is huge; a World Economic Forum report claims that by 2050, there will be more plastic than fish in the ocean. But this current momentum and awareness has shone a spotlight on our society’s relationship with plastic. Convenient, omni-present and sometimes entirely unnecessary. As more and more individuals and a significant amount of businesses make the conscious decision to ditch some of the every day single use items, the environmental impact will be felt through a thousand small actions. We may not be able to take out all the plastic in the oceans, but we can certainly stop it from growing. Moreover, we can also be very assured that industry is paying a lot of attention. Many businesses have tried to pre-empt – or deter – potential legislation by announcing greater commitment to recyclable materials in their products. In Wales, requirements under the Environment (Wales) Act 2016 mean that all business will have to separate their waste at source by next year. Although wholly welcome, the importance of these efforts is not in increasing our recycling rates, but in the hope that it will encourage the emergence and expansion for high quality recycling markets in the UK. The lack of these markets currently are a significant barrier to creating sustainable waste systems and transitioning to a Circular Economy for Wales, something which the Welsh Government has repeatedly committed to achieving. China’s announcement to ban many items of imported waste has put this lack of capacity in the spotlight this year and has reinvigorated the debate on recycling, particularly in England where many areas are underperforming. However, the focus on recycling rates alone is misleading. If we are to truly address the issue of plastics in our society, we need to look at the whole process of extraction, manufacture, design, labelling, retail and consumption – recycling is somewhat of a last resort. Current legal and economic incentives are not strong enough to steer plastic use. In January this year, the EU published ‘A European Strategy for Plastics in a Circular Economy’, part of their Circular Economy ‘package’. The strategy aims, first and foremost to address the lack of market capacity and demand with the ambition that ‘by 2030, all plastics packaging placed on the EU market is either reusable or can be recycled in a cost-effective manner’. The adoption of the EU package by the UK in the Brexit transition is still unclear, although it would be the easiest route to adopt the legislative changes necessary to address current extended producer responsibility (EPR) systems and plastics reuse and design which would be difficult, if not impossible, to achieve at a Wales-only level. However, there are other EPR mechanisms which Wales could take forward and are indeed, currently considering. Although there has been much public debate over this issue, the Welsh Government has recently announced that they are not going to request this but it is still under consideration. However, it is important to note that the primary objective of environmental taxes is not to raise revenue but to tackle environmental challenges, spur innovation and behaviour change. If an effective plastics tax was introduced it would ‘phase itself out’ as industry was forced to work towards alternatives. Similar parallels can be seen in the Single Use Carrier Bag (SUCB) charge. A well designed plastics tax could send a strong message to the industry and force changes, but it is unlikely to be effective in the long term unless it is designed alongside other robust measures and infrastructure. Deposit Return Schemes (DRS) for drinks containers are simple systems where the consumer pays a small deposit on an item which is then returned when the consumer returns the item. Reverse Vending Machines make these schemes easier for retailers. A DRS would create a market but it also fundamentally puts a value on waste items in the eyes of the public. Although applied (most commonly) to drinks containers, there is evidence from the many schemes elsewhere in the world that litter decreases and there are cost saving for local authorities. Scotland announced last year that they are going ahead with a DRS and Westminster are currently considering the options after a period of consultation. Although Wales could follow Scotland and do this alone, a UK wide scheme could be on the cards in the near future. Wales could consider amending the Environment Act 1995 to put high recycling rates on producers, although this may not have the public impact that the above options would bring about and would likely meet similarly strong resistance from industry. The introduction of comparable legislation in other countries brought about retailer-led schemes as businesses came together to avoid fines, such as the Infinitum Deposit Return Scheme in Norway. 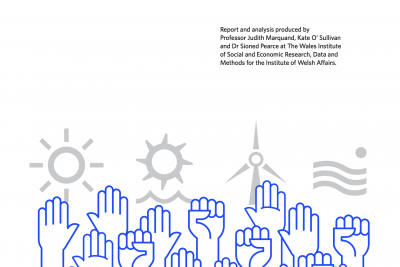 A 2013 report identified that a transition to a circular economy model could have a particularly positive impact on a small country such as Wales and identified potential material cost savings of up to £2.0bn per year. Although this is a long term aim, funding and support for new recycling and reuse markets and alternative product design will be essential. Adoption of the principles within the EU Circular Economy Package – if not the legislation itself – will ensure that the focus is on closing the loop and moving as far as possible from our current infatuation of ‘make -waste- dispose’. There is a great deal of activity across Wales at the moment with whole towns and communities committing to going ‘plastic free’, from Refill campaigns to Plastic Free Coastlines. But while legislation will take time, every individual and every organisation in Wales can play a small part. Reducing our plastic use is an active choice. The public sector – and Welsh Government in particular – could take the lead and have a significant impact simply by banning single use items in their estates and at events. The Volvo Ocean Race in May and June in Cardiff will give Wales a global platform, a unique opportunity to put the words of the Wellbeing and Future Generations Act into action. There are many options, but fundamentally, this is an issue we can do something to change and this year is our window of perfect opportunity. The Welsh Government report on the consideration for EPR options for Wales is expected to be published in February 2018. All articles published on Click on Wales are subject to IWA’s disclaimer. Are Clean Air Zones in Wales a dead duck?